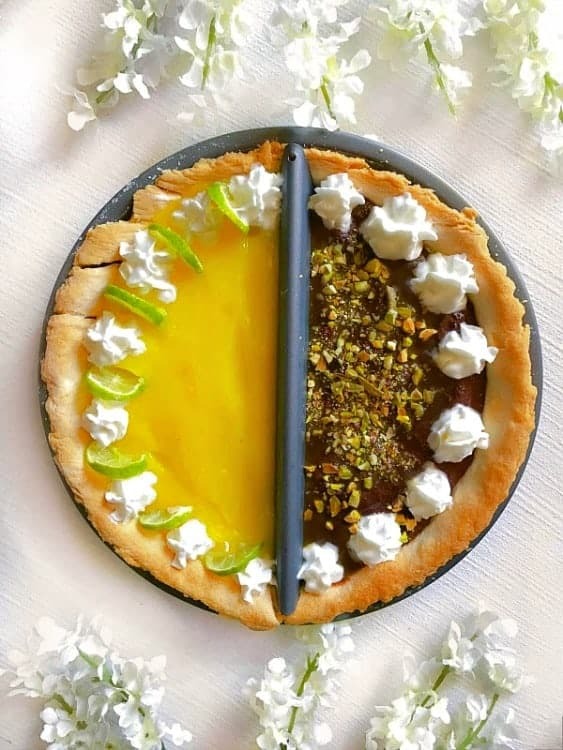 Truffle Pizza and Two-in-One Pie | 2 Date Night Recipes: Two delicious and easy recipes that would make your date night meal planning a breeze. Make them and have more time to spend with each other. Both the recipes are done within 30 minutes. 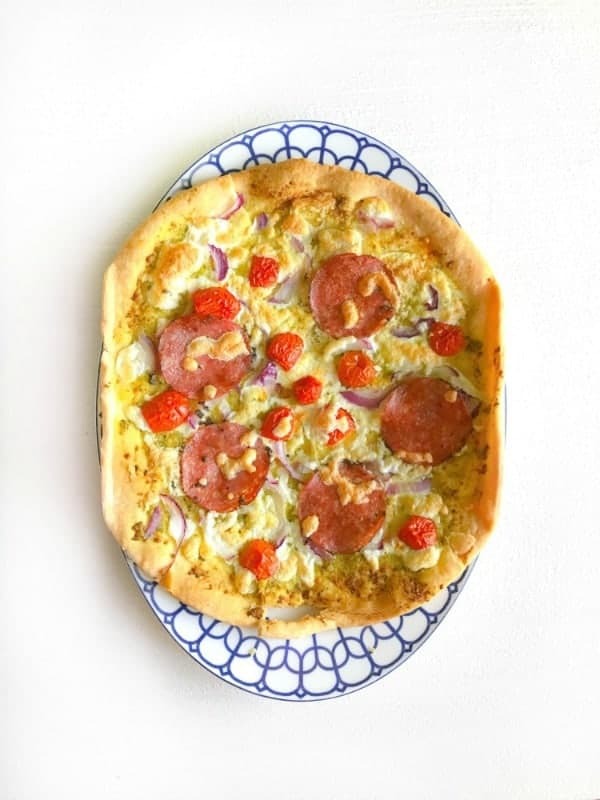 Happy Weekend Everyone and here’s a quick ‘ Date Night Recipes – Truffle Pizza and Homemade Pie ‘ that I wanted to share with you’ll. A few days back I had received this really sweet request from one of our frequent readers and she wanted a quick date night recipe ideas. But then, I also decided to create a meal just for two using my new Chicago Metallic pans. 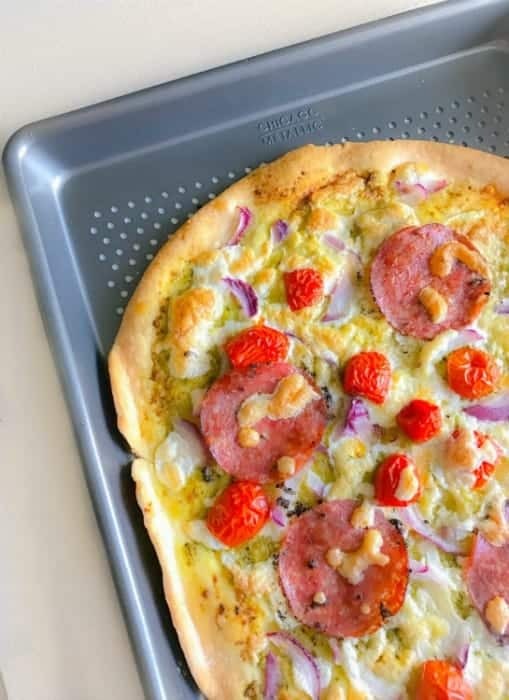 Hence, I decided to make an easy Pesto Truffle Pizza and Homemade Pie that would be a perfect combination of deliciousness and comfort-food. It’s a meal, you can prep a night before (if you have time) or even 40 minutes notice. Just use any homemade or store-bought pie crust and both the recipes can be done in 30 minutes as they can be both baked together. 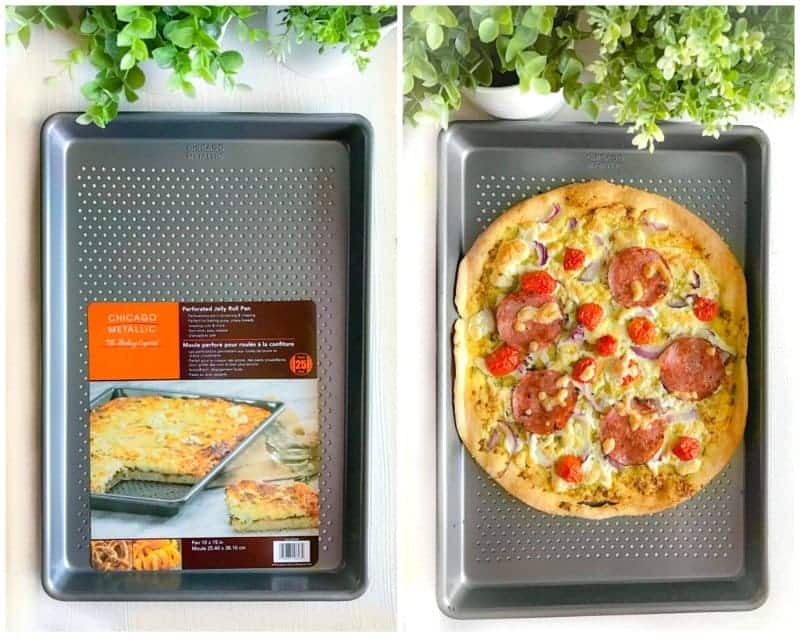 The fun part in all this was creating the ‘homemade pie’ using the ‘Split Decision Pie Pan’ (picture below). It’s a dream come true for pie lovers as you can not only make 1 but 2 pies in one go – how cool is that!! 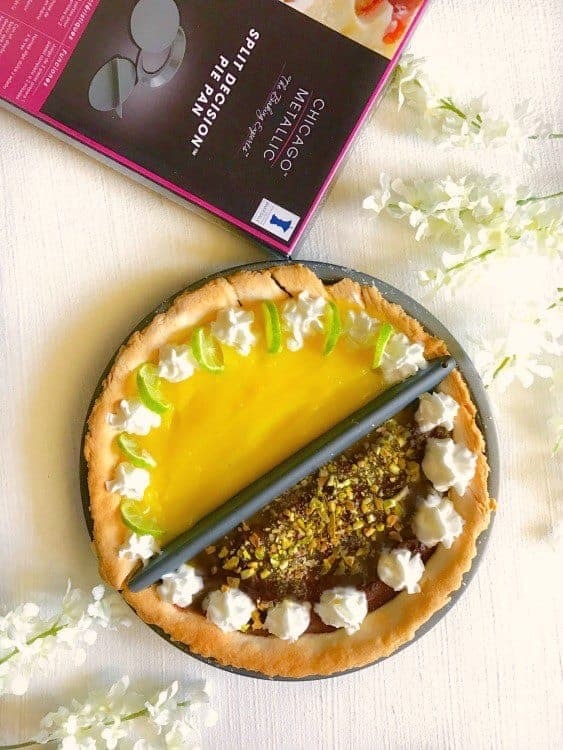 It’s also really convenient if you and your loved ones have completely different pie choices and in our case, it’s perfect as he’s more of a dark chocolate lover and I’m more of a lemon/fruit pie lover. Once, I finalized the pie recipe, the pizza was a breeze as it’s just pesto, truffle oil, chicken salami and few veggies. For pizza I used a ‘Perforated Jelly Roll Pan’ as it gives an even and crisp base because of the even distribution of heat. Once, both the Truffle Pizza and Two-in-One Pie recipes were prepped, I baked the pizza and the pie crust together in the oven and after 15 minutes, took out the pie crust while our pizza baked for slightly longer. Once the pie crust was all cool, then I just mixed different pudding flavors (lemon and chocolate) in separate bowls. Then I placed the pie pan separator on the cooked pie crust and layered each side of the pudding. Then finally decorated with some whipped cream and toppings on each side and kept it in the fridge for chilling while the pizza baked. 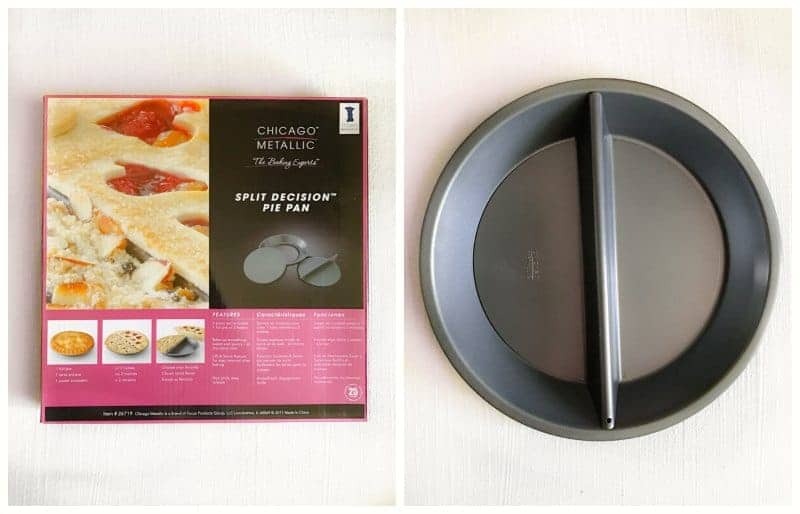 So go ahead and try this recipe and check out more bakeware options from Chicago Metallic as they are all very good quality and dishwasher safe too. 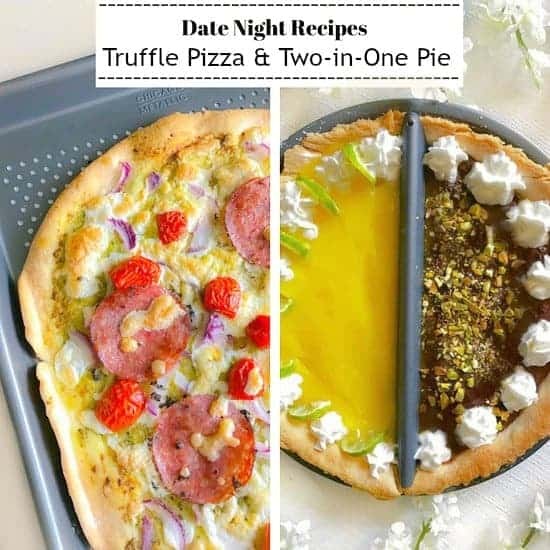 Truffle Pizza and Two-in-One Pie | 2 Date Night Recipes: 2 delicious and easy recipes that would make your date night meal planning a breeze. Place the pie crust on a baking sheet. Spread the pesto evenly over it. Now add salami, chopped tomatoes and onions. Sprinkle shredded mozzarella and drizzle with truffle oil. Place the pie over the pie pan and trim the edges. Add the dry beans or pie weights in the pie pan and bake for 10-15 minutes (till crust is evenly cooked and golden in color). Once baked, remove the pie crust from the oven and cool completely. Now, take 1 cup of chilled milk and add the lemon pudding mix. Whisk it evenly till no lumps are there and the pudding starts to thicken. Now, take another cup of milk and add the chocolate pudding mix along with 1tsp dark chocolate powder (if using). Once our pie crust has cooled, add the pie separator on it. Add pie filling on each side. Decorate with whipped cream, lemon, pistachio and chill till ready to serve. (If you are serving it after a long time, then don't add the whipped cream yet as it will flatten). No Replies to "Truffle Pizza and Two-in-One Pie | 2 Date Night Recipes"